Feeling refreshed coming back from Fincon, the physician-philosopher got his voice back and we hit the ground running with a very nice discussion on the current state of Academic versus Private practice in Anesthesia. Now since we are only two people working in two different institutions this discussion is far from all being all encompassing. Despite this were able to cover quite a bit of ground in looking at compensation models, working conditions, common challenges with new graduating residents, Debt, fellowship training dilemmas, generational differences in medical practice and of course lots of PHILOSOPHY. Which did we decide was the better choice after all the dust had settled? I guess that decision will be up to you after you listen to the podcast. Docofalltradez: So today on our show we have the physician philosopher. Hopefully this might be his inaugural podcast but depending on the other podcast. Well I'm just hoping I'm hoping I get to be your first anyway. The physician philosopher on today. He is an expert on wealth and wealth and wealth and wellness and he has a website called The He's done numerous post has an amazing website and he's been featured on websites such as the White Coat Investor and I believe on Physician That is correct. Excellent. Well hey I'm going to call you TPP welcome to the show. Physician Philosopher: Thanks for having me. I appreciate the opportunity to be on here. Docofalltradez: And you know we you and I met at fin con and we had an awesome time. And one thing we both realized early on is we're both anesthesiologists and we have a very similar but different practice models. And so I reached out to you and thought we could discuss that. Now you are a academic anesthesiologist and I'm an employed anesthesiologist so I'd like to kind of just talk about the difference between being an employee in a non not for profit large institution versus an academic institution. Docofalltradez: So let's go and get started. Now how did you go about choosing that you wanted to be an academic because there are numerous choices that you can make as an anesthesiologist. Me personally I chose to go into private practice but you chose group practice. I mean academic practice. How did that choice take place. Physician Philosopher: Yes it is kind of an interesting journey. I mean I do work at a large academic hospital now and when I was a resident I knew a few things about myself. I knew that I like to teach. I knew that I liked practicing anaesthesia and I really didn't have much of a love for research at the time but fortunately I'm in a group at a hospital that doesn't really force that on you. And so it wasn't demanded for me to do research. And ironically in my third year of residency I stumbled upon a couple of questions clinical questions that I felt like weren't answered adequately and started a couple of randomized controlled trials in my last year of residency that I ended up concluding as my first year in attending so as I started the road not really enjoying research I found that when I was asking a question myself and designing a project to answer it I actually did enjoy it. So it produced a situation where I wanted to be good at all three things that are academics which is clinical work teaching and research and to this day that remains my focus. My main gig is being good at all three of those things and that pushed me towards academics because some of those options are limited in private practice. Docofalltradez: So did you do you even consider going into private practice at any point. Physician Philosopher: I did yeah. There's actually a few groups that I looked at. And you know the big draw of course in anesthesia at least is that you get to maintain the breadth of practice whereas in academics I'm very defined in a specific niche. I did a fellowship in regional anaesthesia but before I did that I did consider going into private practice and the idea of maintaining a very broad scope of skills was appealing to me. In addition to you know the various differences between private practice in academics. But yeah I guess I thought about it. Docofalltradez: Well there's going to be a difference in terms of reimbursement between academics and private practice. Was that ever a consideration in your decision. Physician Philosopher: It was you know just like anyone else I came out with with student loan debt though I had less than the average. So you know money certainly played a part for me it wasn't the substantial part though I you know I really looked at it as what I want to do with my life where I want to see myself in five or 10 or 15 years and made the decision based on that information. Money did play a part in that. You know if there was a massive difference between the two I know I might have been pushed one direction or the other. But nowadays that difference is getting smaller and smaller with each day. And I work at an academic hospital where I'm paid pretty well. Docofalltradez: And you know it's funny I haven't really been looking at the differences lately but when I was coming out of residency that the difference was rather large. And back in 2005 when I graduated they were offering pretty enticing signing bonuses which then really went away. Around 2011 2012 and now they've come back with a vengeance. And there are people in my who are graduating that that I'm currently teaching teaching and mentoring we're offered massive signing bonuses. Do you find that they're giving signing bonuses at academic institutions or have you been enticed with any signing bonuses yourself. Physician Philosopher: There are you know it's just different than ever every hospital and every anesthesiology group whether academic or private practice has a different model and so where I am you can get kind of a signing bonus. They may help you with moving expenses they may help you with the number of shifts that you required to work that year in decreasing that such that. You make more money for less shifts and sometimes they will give you an outright bonus to start. But I would say that that I'd imagine at least in my experience that those numbers are going to be smaller than what they are in private practice. Docofalltradez: Well you know and you also mentioned that you graduated with some student debt and I imagine there are more opportunities to get that student debt forgiven in an academic than versus private practice. Physician Philosopher: Yeah it's actually interesting. You know I I'm doing a study in my academic job where you know we're looking at student loan debt surveys and determining financial literacy is regarding student loan debt management and you know in doing that I discovered that about 75 percent of hospitals you know all comers are 501c3 or governmental hospitals that would qualify for public service loan forgiveness. The implicit assumption there is that you are in fact employed by that hospital though and not working in a private practice group that contracts for the hospital difference there. Right. But if you are employed by the hospital itself then you have a 75 percent chance of going anywhere in the country that your hospital whether academic or not is going to qualify for public service loan forgiveness. Obviously all academic institutions do for the most part. And so that did provide an opportunity there although that's not the route that I'm going personally. Docofalltradez: Well you know I think that would be something really to look into. If 75 percent like you said there's a there's a good chance and then if you could potentially tie that to a signing bonus you could take quite a good dent out of your student loans coming out. Oh sure absolutely. You know a very different choice would be going into solo practice then. Now the problem is if you do have a lot of debt a lot of these private practices will have a b I looked at two different jobs my current job there was no buying but I looked at another job and the buying was you get a reduced reimbursement the first year and that that reduced reimbursement then becomes your buying and it could be upwards. In my case I was gonna be something like one hundred thousand dollars so I imagine for a student who's kind of with debt they'd be more they'd probably less willing to take on that risk. And so of the graduating residents that I'm mentoring right now most of them you mean they have absolutely no desire to take on the risk given their student loans. Are you finding that to be the case with your with your graduating residents. Physician Philosopher: Yeah you know I don't know too many they get excited about having a buy in when they're carrying three or four hundred thousand dollars in student loans having to buy another one hundred thousand dollars off of their salary to do that. Most people are trying to find a job that balances work and life and then also allows them to have a high enough income that they can really put a dent in their debt. And of course that all assumes that the person knows anything about personal or physician finance which I find is not the majority of people you know but those that do yeah. I think that they certainly consider that in the possibility of paying off their debt quickly so they can move on with her life and try to get ahead financially. Docofalltradez: Well you know again it also depends on the specialty so some specialties are obviously much more lucrative and buying into a surgical center. As an orthopedic surgeon or another type of surgical specialists could be fairly lucrative whereas you know other you know other professions like ours those opportunities really don't exist so it's really I think it's specialty specific as well. No I completely agree. Let's see here. So part of the problem that I was looking at a recent survey of graduating attendings and it seems like these they seemed to change jobs rather quickly within the first two years something like as high as 50 percent of them will will change jobs. Have you noticed that at your institution. Physician Philosopher: Yeah I have. It's actually it's actually funny I was having this conversation with a resident the other day who is just you know bent on buying a house when they move out for residency or out when they graduate residency into their in their private practice job. And I really just encouraged the person I said you know the smart thing to do is to rent a house for a year or two and make sure that you like the job. And you know they asked me why and I said Well because I can't tell you the number of people that go to a job and then a year or two later they come back in the interview where I am where they trained you know a year or two later. And the reason why is because a vast majority of them sign on to a job that's presented one way and the expectations don't meet reality when they get there. So yes I absolutely found this to be true and I'd say the number is probably pretty large. I think that I heard someone mentioned noted numbers almost 50 percent of doctors will change jobs within the first five years of finishing training so you know as a financial expert do you think this is a good idea to change jobs that early. Oh man it hurts particularly if you buy a house. Physician Philosopher: I mean you know if you buy $500,000 our house and you know you're gonna expect to cost 10 percent to sell that house I mean you have to come up with 50 grand and most physician loans which is what most graduating residents are gonna use requires zero percent down payment. So now what do they have hundreds of thousands of dollars in debt and now they have to come up with fifty or seventy five thousand dollars to sell their house a year or two later. And they definitely have that equity at that point. And so it definitely is a big decision and the other thing too is that you know academics in private practice both have tracks you know in academics. It's your track to become an associate professor from assistant and then from associate to full professor later. And so if you delay that for two years or three years or five years because you went to a job you didn't enjoy that's gonna be a problem. And the same thing for private practice if you join a different group your partnership track and start all over again and you're now two or three years behind your peers because you signed up for a job that you know isn't what you wanted. So it has financial and you know wellness implications all around. Docofalltradez: What's interesting as physicians I don't think other professionals realize that as physicians when we change jobs in many cases you have to start over again. Whereas we'd like us here and is a perfect example I see Arnie will get compensated based upon years of experience whereas with us we actually have to then rebuild the practice and so you'd actually lose money with every change in transaction. Physician Philosopher: Yeah. That's that stuff. True and you know I think it's it's such an important decision you really do want to try to get it right but you're also making that decision off of you know based off of incomplete information. I mean you can only know so much about a group before you join. Physician Philosopher: And so I think the best thing to do is just to minimize the amount of damage that could happen if you tried to change jobs later if you didn't like it. And you know of course none of that conversation even involves covering you know your tail for malpractice and whether you know the person is gonna let you do that and if you got money upfront that signing bonus that we talked about earlier or money toward your loans oftentimes they'll make you pay back. And so you know you just get further and further and further into the hole so as many of those things as you can mitigate when you make that decision I think that that's the way to go. Docofalltradez: Yeah. You know I was talking to a Physician on Fire about that and he actually got a hundred thousand dollar signing bonus but after he had you know had attended that particular job for a period of time decided it wasn't for him. He ended up having to pay back part of that money with interest. And so the more you talk to people the more more common you realize it is a hassle. I just recently talked to a guy named Alexi Nazem and he is the owner of Nomad health marketplace. You've heard of him. I haven't. OK. So nomad marketplace is a place where you can traditional you know traditionally when you're trying to find a job you might use job boards or go to you know your various Web sites that have you know like the back of a magazine or your. Sure publications et cetera. Well he's created something where you can actually go there enter your name enter your specialty and then find a job. So he's trying to create the like Uber of job boards and it's a brilliant idea. And you're talking about this and we. And he he had a really interesting insight his marketplace really is looking to help increase and improve locum tenants. So for example if you're if you're an employer looking for a high quality provider and or if you're a provider looking for high quality employer it's a way to skip the middleman and find the person directly. And so he actually recommends doing locums for a couple of years to kind of get a feel for the you know maybe the marketplace location which which I thought was very interesting. And you know with a new gig economy and the way millennials think it sounds like more and more people are doing that. Have you noticed that at all in your institution. Physician Philosopher: No I have not seen a lot of people go directly into locums tenants like I completely understand why it's appealing why that would be helpful. I haven't seen a lot of my residents you know personally do that. The ability to have a ten ninety nine and then pay for you know lodging and travel and you know pay you a pretty good fee is is really appealing but I haven't noticed that you know down in the south where I work. It's a good idea though very good idea. Docofalltradez: OK. So would you consider yourself a millennial. Yeah. I just meet the criteria. Ok. Now I've noticed that millennials tend to emphasize work good work life balance more than compensation and or other things. Where do you stand on this. Physician Philosopher: I'm absolutely a fan of that thought process. You know. On my Web I really talk a lot about balancing life and making sure that you're making smart financial decisions and making the head happy and then also making the heart happy. You know I don't think that you can really have profound wellness without without doing that. And you know that they're just they're just things that you know I talk about a lot about self identity on sort of my posts and really what I'm getting out there is that as a profession physicians often lose themselves in who they are and and being a physician ends up defining them. And I am so many more things outside of being a physician that I care more about and that doesn't mean I don't love my job. Physician Philosopher: It does me I'm not passionate about it or good at it but I am you know I'm a father I'm a husband you know I'm an author an inventor craft beer lover and there's so many things I love outside of medicine. And so you have to find balance no matter how much money you make if you don't have that balance you're not going to be happy. And so I think that money plays a part but it is certainly not the most important aspect. Docofalltradez: Well you know it's interesting I I've been meeting a lot of not only an older older Gen Xers but baby boomers and they are so defined by by their work that they you know even when they when they come to retirement they want to put in another year or another year because they can't see themselves outside of medicine yet. Physician Philosopher: It's actually been a fascinating time because you know we do have that mix of different generations. And I think that you know a lot more than anything I'd probably call myself so I feel when I read this but it's called being a Xenical. So in between a millennial and a generation Xer and I can relate to both of those ideas you know I can relate to the thought process of the Generation X that millennials are entitled and want a bunch of stuff for for nothing. Docofalltradez: Well you know there's so much dogma in medicine that the mere idea of even questioning it especially back when I was training was unheard of. And now the millennials they're very bold and they have you know they know they can command an audience because they're going to be the majority of the workforce here very very soon. So I've learned a ton from them. I applaud their efforts. And in many ways I kind of kind of wish I was a millennial. Physician Philosopher: Yeah it's it's definitely interesting time. Docofalltradez: Well you know the interesting thing about millennials and the marketplace and I've been kind of thinking about this quite a bit in terms of the job choice. So if we want to emphasize work life balance if we want to have the ability to have lives outside of medicine in exchange for less control in the workplace there seems to be an issue with that. So for example when I came out of medicine 30 percent of people of physicians were employed whereas now 30 percent of physicians are. Going into private practice. Now the downside of being employed is you really don't have control over your schedule. You don't have control over. You have no control over the business and you kind of dictated by people who were running the business what what your your hours need to look like. Now we do that in exchange that we don't have to run a business but it seems to me that the long game it may be to our benefit to be controlled by others. And so I'm wondering if that's going to interfere in work life balance in the near future. Physician Philosopher: Yeah definitely can. You know there are there are pluses and minuses to this. You know the the true solo practice that was granted for anesthesia that's never really been a thing. It's been very tough to cover something 24 hours a day for three and six five days here by herself. But you know that's the ultimate autonomy when you have a family practitioner or an ophthalmologist dermatologists that that owns their own practice and they can dictate their schedule however they want. So from that end of the spectrum to being an employee where you were told when and where to show up for work every day and how you're going to do your job that that's a spectrum. And I do agree. But you know the benefit of being employees is exactly what you said. I don't have to worry about any of the overhead. I don't have to worry about billing. I don't have to worry about you know any of the business aspect of medicine in terms of my main job. And that is a benefit for me. But it does come with the cost of not having as much flexibility in the schedule. And also you know this may be true for private practice groups too with you know senior partners but you know a lot of my job is is dictated by those that are above me and you know what they think is best for my career. And that's that's an interesting place to be. Being a very proud independent person. So you know there are pros and cons to it for sure. Docofalltradez: Well let's get into the weeds a little bit then. So you mentioned it that if you're in solo practice obviously you eat what you kill. And so if you don't kill anything you're not going to get a you know this can be a lot of comp at risk. And with most employed positions and I'm sure that's the case with the academic positions you have a guaranteed comp right. You're so you'll have a portion of your contract that says this is how much money you're going to make it regardless of how productive you are. And usually they'll put some money at risk as to incentivize you to do something. And in the case of my job I'm incentivized to not only work to meet a certain level of you know ASA units or RVUs use but also there are quality indicators that we're expected to meet like cancellations. There are staff satisfaction scores patient satisfaction scores, showing up on time. So they created this what we call a balanced scorecard to make sure that you know not only do we meet the requirements to generate money for the hospital but also that we're being good stewards of that of our institution. Do you have something similar to that in your institution. Physician Philosopher: We definitely have a base salary and then incentives they're not the same as yours though which I felt was fair instead listening to what you were listing off there. So we have incentives for academics officers and non-clinical incentive which might include attendance at certain things like grand rounds or in faculty meetings. It also includes billing. So you know how frequently do you close your charts on time and you know there are other things that incentivize us for academics. And so in terms of you know just pure research or teaching and there's a point system and depending on where you fall in that point system you get a certain incentive. We are also incentivized in that when we pick up an extra shift we make more money. So we're not paid a flat salary. We do have a base salary but if we increase our work and provide more shifts then we're required then we get paid more. And I do know that you know at least the surgeons at my institution you know they they are they definitely have RVU to how they get paid. And so that allows them to do more cases and to make more money that way as opposed to picking up shifts like we do Mm hmm. Docofalltradez: Yeah. That's interesting how you can you know I guess each each at each employer will have certain things that they deem very important so like for example meetings attending meetings for some employers is very important. So we I personally can't stand meetings I used to attend them all the time and now. We no longer have to attend these meetings. But I can see I could see the value in forcing people to attend meetings especially if they are trying to enhance the your department like for example teaching residents or or grand rounds. So do you do they pay per meeting or do you have to meet a certain threshold of meetings at your institution. Physician Philosopher: Yeah. So the way that works for us is that we we have to meet a certain percentage of attendance and that's that's how we get paid. you know the conversation kind of reminds me of Tim Ferriss his book The Four Hour Work Week. Physician Philosopher: And you know I'd reading that book a lot of it can apply to to medicine just because people are sick all the time so you can't work four hours a week. But he had some really interesting ideas about meetings and stuff and basically talked about the fact that you know very little gets done at meetings. And so he would make a point to try not to ever attend them unless he was made to. And if he was made to attend meetings he would try to make a very clear idea of when he needed to leave. Physician Philosopher: And you know I fall somewhere in between the spectrums I do think that some helpful things can be done in meetings but it is exactly what you said it depends on what the meeting is for and what it's about. What we're trying to accomplish because otherwise people just talk and nothing happens. And that is kind of the opposite of my personality. So I do talk a lot but I like to get a lot done to. Docofalltradez: I want to talk about the opportunity cost and return on investment of fellowships. You wrote it and you wrote an awesome article on the white coat investor that really generated a ton of traffic and questions and that's come up recently in my practice one of my partners recently after working for five years decided to go back to do a fellowship and you know the argument really went back and forth about you know when is it a good idea to do a fellowship and under what circumstances. Now you did a fellowship in a non accredited fellowship and you have. How do you do you have any regrets about doing that or you're totally happy that you did that. Physician Philosopher: No I'm completely happy that I did what I did was not accredited so that means I got paid more I got paid about double what I made as a last year resident a fourth year resident. So that was part of the benefits and my opportunity cost a little less there. And I do what I love you know I love regional anesthesia. I love doing it. I love teaching it. I love performing the blocks of studying it. And so if I had not done a fellowship I would have regretted it honestly and so knowing that about myself regardless of how the money turned out I was I was pretty happy with the decision. But I do think that there is an opportunity cost that has to be considered. You know when we're having this conversation you know you're going to you're gonna lose salary which is you know I talked about in the white coat investor post but you're going to lose salary and most people mistakenly think that that's the first year salary that you're gonna miss. In actuality what happens is that the last year you would've been a partner. You're going to miss one year of that. So that last year salary in my opinion is the one that needs to be counted. Physician Philosopher: So whatever your top pay is expected to be is the money that you're losing and you're obviously not going to be able to pay down debt or invest in the market as you know as heavily while you're in training. And so if you're earning a fraction of the money you'd be earning as a as an attending then you're gonna have to delay you know really destroying your debt or investing aggressively for just one more year. And I've actually heard it said that you know a way to use this time is to basically use it as a financial fellowship. So you know I don't regret the decision at all. Docofalltradez: Well so I guess when what circumstances would it be a bad idea to do a fellowship then. Physician Philosopher: So I think that a fellowship is a waste of time if it's not going to help you get a job and you're not going to be doing what you did the fellowship. So it's it's not uncommon that someone will do a fellowship in something I can use my own just I'm not pointing fingers but they do a fellowship in regional and they sign up for a job where they're going to be sitting there on cases you know as it's physician only anaesthesia and and the group does you know 5 percent of their cases under blocks. That's kind of a waste of a year because you're not really gonna be using your skill set. And in addition to that you lost all the opportunity for the money that you would have made that year. So I think that that's one classic example of that situation and in the other honestly is is that if you're doing it for the money. Physician Philosopher: I mean if you're just doing it as a purely financial reason you know that's probably not gonna make you happy you know and I think that that comes first. Docofalltradez: Well and then there's also the break even point and so depending on the specialty. I think I was reading that love. Sure. What is it infectious diseases and pediatrics and then trauma trained orthopedic surgeons. Their break even point is like infinity they'll never break even. So I think to your point as you kind of have to you kind of have to love that to even consider doing it. I completely agree. Physician Philosopher: It's ironic that you mentioned that specialty so despite the fact that I wanted to anesthesiology I really like my pediatric infectious disease rotation because we had some of the most hilarious physicians that were heading that group. And so we got around round with them every day and they make fun of each other and had a great time and they're just a great group of doctors. And so for a little bit I teased around the idea of doing that. You know I've come to find out it's just because I liked those physicians and I realized I could be a great physician in other fields but I looked at their salary and I couldn't believe it. Physician Philosopher: You know they spend an extra three years after pediatrics to do that. And I mean they make less than a general pediatrician typically. It was incredible. Docofalltradez: Well you know there's such awesome people that they would have to be awesome to even consider doing that. Now I kind of want to reach out and give them a big giant hug and and introduce them to a couple of my attorney friends to help them start negotiating their contracts. Absolutely. You know but but you know again I think it lends to the fact that they have such nice personalities that they would never even consider putting their patients in harm's way. They they they put taking care of their patients above all else and you got to admire that. And I absolutely do. But I think you nailed it man. If you want to go into a fellowship just for the money it's going to it's going to leave you empty. I totally agree with that 100 percent. My fear is when one of my peers he's he just left general anaesthesia to do cardiac anaesthesia and I'm hoping he's doing it because he really really loves it. His main I think his main fear is that that given that we have other market factors playing into anaesthesia such and specifically see our knees that his concern is if CNN's were ever made equal to anesthesiologists that could put a lot of downward pressure on our on our specialty not only in what we're doing but also in reimbursement. And so his argument is if you have a specialty like cardiac anesthesia that that you'll never be at risk. And I'm not sure if that's entirely true but it certainly gives you some level of protection. Physician Philosopher: Yeah I think it's an interesting time to practice anesthesia. This is a question that a lot of my students ask me when they're thinking about going in anesthesiology. Physician Philosopher: But yeah I think that it's tough because some of those things are really just emotional support. I mean it makes you feel like your job's more protected but ultimately a lot of these decisions are made by politicians and bureaucrats that may or may not know anything about medicine. And so you know it's it's one of the reasons why advocacy is important. But you know it's it's also a conversation about you know where exactly we'll fit in in the future of of medicine and how our role might change. But you know the idea that someone else can't get you know someone to accredit them for for something is kind of it's kind of strange because even even in my world that's happening there are programs for advanced practice providers to get pain fellowships and that's a thing. And so you know it's interesting. Docofalltradez: So are you talking about nurse practitioners. Physician Philosopher: CRNAs ones that I've seen. Yeah. And so they can you know or the idea that you can go get a weekend training and in doing blocks and then come back and do it. You know it's the question always is is you know what is competent and there are disagreeing opinions on that you know. Physician Philosopher: But I will say that by and large I absolutely love where I work where you know we supervise. But I have very very little problems with this in real life. You know at all and a lot of it ends up being conversations that are in our head you know about how we're gonna protect our know our job or our field. And I think and what I tell my residents is that if you're at the tip of the spear you know practicing Anaesthesia at the intricacies and the furthest science that we have at that point and you continue to push that spear further you're always going to be protected. There's always a need for someone like that you know. But if you want to go and you know do a practice job and have you know No weekends no nights and do G.I. sedation then yeah I mean there may be an issue in the future. Docofalltradez: Very good point. And again there's there's ample evidence that the care team model in other words anesthesiologist supervising multiple CRNAs a safety net that you wouldn't you would otherwise have if you're by yourself either as a physician and or as a So I'm not really worried about it myself you know for people who were considering anesthesia and worrying about the longevity of this specialty I really don't think it's gonna be a practice in fact I think with the advent of artificial intelligence and just improving technology I think I think we have a very bright future I agree. Physician Philosopher: You know and like I said I love what I do at work and I have great relationships with you know all the CRNASs and residents that I work with and think the model works well and you know I've definitely had experiences where you know as part of that care team model I helped save patients when things were missed and I've definitely had you know people help me. Physician Philosopher: That's why it's a team you know. And people talk about that. That's the idea behind systems based safety systems you know. And the idea that the team is more likely to catch an error than a single individual. And so I'm definitely big proponent of that. Docofalltradez: Excellent. Well so let's let's talk about the podcast so this podcast is about negotiating and the whole premise is I believe very strong in researching every topic before proceeding with important decisions. We've kind of already talked about this but one of the most important decisions you can make in your career is your first job and your first contract. And it's because what it really does is sets into motion your future earning for years to come which will then compound over many years. So what what is the most important piece advice you would give a new grad given all your recent experience and what you've gone through up until this point. Physician Philosopher: You know we talked about some of that earlier but this is kind of one of those situations where you need to trust but verify. And that's kind of the anesthesiology creed but you need to do your due diligence. You need to go and research the potential opportunities that are out there but before you do any of that. Honestly the most important thing is figuring out who you are. And what you want because the right job for someone else may maybe the completely wrong job for you. And so I think that time well spent deciding how you want to live your life and what your next five years are going to look like in 10 years and 15 where do you see yourself in 20 years. You know what do you want your life to be. And after you have decided that you discuss that with significant others or family members then you can consider looking for a job that can help you get there. And that's gonna look different for everybody. But I do think that is very difficult to get the information you need sometimes you can talk to prior grads you can talk to the current partners sometimes there's questions that you that you have that you feel uncomfortable asking in an interview setting or even afterwards. Physician Philosopher: And they're important questions. And so I you know I do think you have to do as much research as you can. But the other you know other side of that is that you have to protect yourself and realize that 50 percent or so of residents who leave and go pick out pick a job end up coming back or Or you know changing jobs at least in the first five years and so you can't you know bear your anchor at the first job that you have expecting to stay for eternity when you know that's not the case for a lot of people. So I think that you need to first know yourself and figure out who you are what you want and then you need to do your due diligence do your research and ask all the questions that are important for you to get there and then also to have a safety net to fall back on that you don't make a ton of financial decisions early on and inflate your lifestyle to a point that you can't leave the job if you want to. Physician Philosopher: I've got lots of plans obviously to continue to produce content and all I've ever really wanted is to help people and to get this message out there that financial independence can be used as a tool to prevent and treat burnout and then to help protect people from the conflicts of interest that exist on the financial world you know and so I'll continue to produce content. You know I'd like to get it in front of the right audience because obviously resonates with the right person but they have to see it first. I'm writing a book right now. I've been writing a book for I guess six months now and it's currently being revised and I have to decide how I'm going to publish that if I'm going to just do it on Kindle Direct Publishing or if I want to go the formal route. Physician Philosopher: So I'm still kind of thinking through that and you know at some point I'd like to make courses for people to kind of sort through these these issues when they finish training because my target audience is medical students residents and early career attending physicians and other high income earning medical professionals. So that's kind of on the docket for four for me right now. Docofalltradez: Sounds awesome. You know you did mention just now that you can use financial independence to fight burnout. What's your philosophy for for how do you use financial independence to do that. Physician Philosopher: So I think that what financial independence does. You know people talk about money a lot. We talk about wealth a lot. And ultimately that's not really the you know what you're shooting for you're not aiming to just get a bunch of money. What you're aiming to do is to get enough money that it provides options and those options allow you to design your life how you want to live it. So you know the idea there is that you know we talked about these you know employee jobs or situations where you don't have complete control and this allows you to take further ownership of your life and kind of have some leverage. Physician Philosopher: You can leave a job that you don't like. You can go part time because you have the money to do that you can decide to work outside of medicine or do a side hustle to help produce financial independence and you may find that you enjoy that. So I think that all of those things really what they do is they provide options and those options allow you to fight burnout and then the causes of it. Docofalltradez: Very well spoken well great. Hey it was a pleasure having you on the show. I want to encourage every single person to go ahead and read your blog posts. They're amazing. I think you've done an amazing job reaching out and connecting with all the other physician influencers. And I look forward to reading more of your stuff man. It's awesome. Physician Philosopher: Yeah thanks I appreciate. Thanks for the opportunity to be on air. It's great fun. Docofalltradez: And hopefully you will be. This will be your first podcast. You heard it here folks. Physician Philosopher: That's right where I was made famous. Docofalltradez: Yeah that's right. Well hey I just think again once again I like to think that physician philosopher for being on my show if you'd like to learn more about him head over to his Web site. The physician philosopher dot com. If you'd like to get the show notes on this podcast head over to the There you'll find a little more information about the physician philosopher a PDF on the show notes. You can subscribe to the Web for updates on every single podcast and you can also subscribe to the podcast on stitcher on iTunes on Google podcasts and possibly even Spotify if they ever get their act together. Anyway once again I'd like to thank everybody for listening and please subscribe please give me some feedback please give me some comments. Would you'd like to learn more about some future episodes if you'd like to have any tips or tricks or if you want to be a guest on my podcast. Hit me up. Thanks for listening. Docofalltradez: Thank you for listening. We hope you enjoyed the position a podcast show notes and other resources. 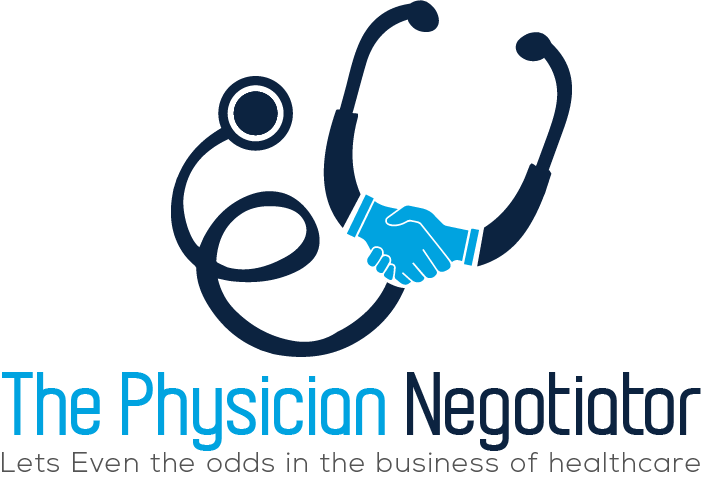 Docofalltradez: Please visit the physician negotiator dot com. 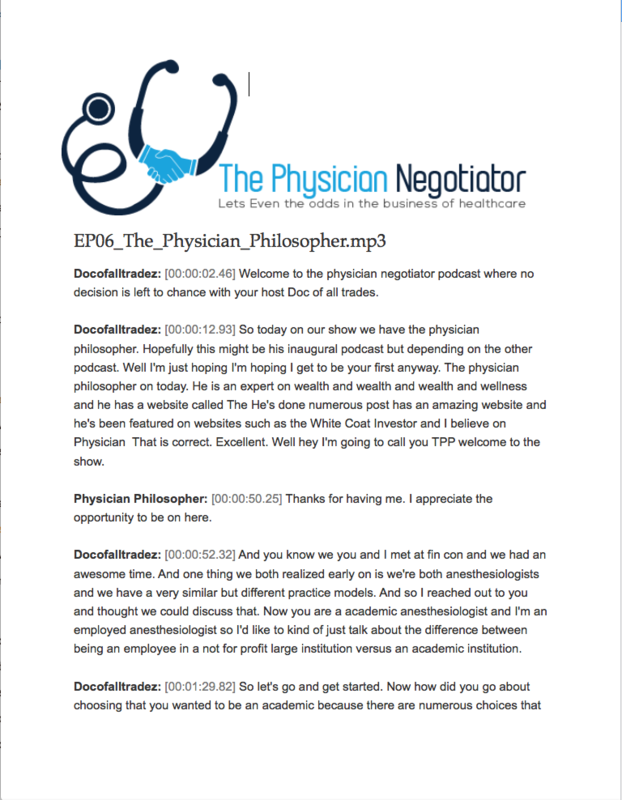 The above audio transcript of "EP06_The_Physician_Philosopher.mp3" was transcribed by the best audio transcription service called Sonix. If you have to convert audio to text in 2018, then you should try Sonix. Transcribing audio files is painful. Sonix makes it fast, easy, and affordable. I love using Sonix to transcribe my audio files.